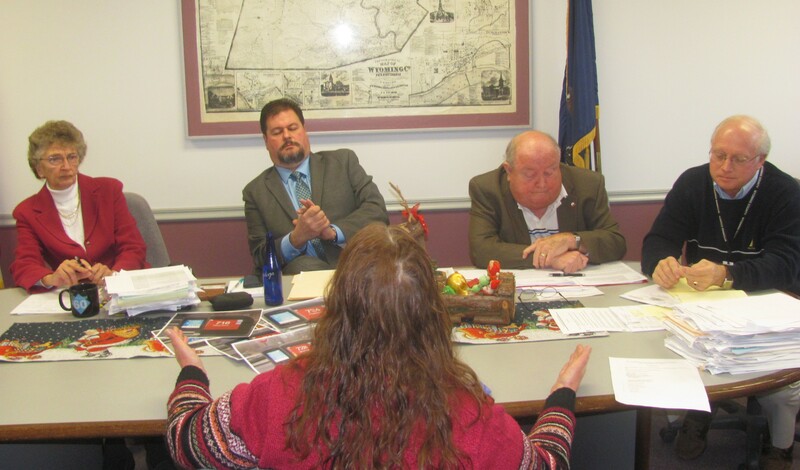 Wyoming County Commissioners (top, from left) Judy Mead, Tom Henry, and Ron Williams and Chief Clerk Bill Gaylord listen to county resident Joanne Gabrielson (center), who urged them to approve a contract with an independent firm to conduct air quality studies prior to the construction of a silica transfer facility in Tunkhannock Township. Any studies conducted by DEP and EPA, she maintained, would be inadequate and not provide enough base data for future studies. 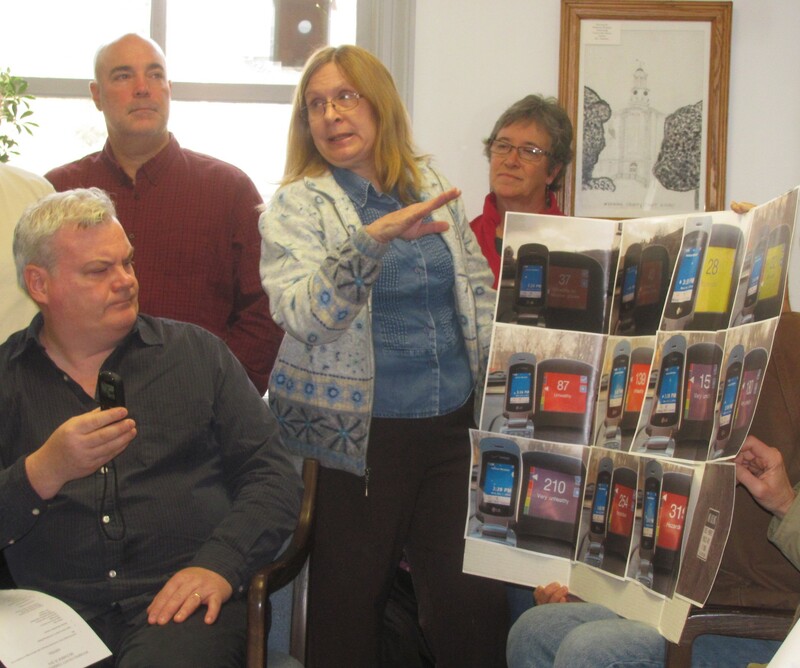 A few minutes prior, Audrey Gozdiskowski (above) displayed a series of air monitor readings that she insists are indicative of already poor air quality in the area. At the most contentious meeting of the Wyoming County Commissioners that anyone in attendance could recall, tempers flared and protocol suffered as those who originally opposed the construction of a silica transfer facility in Tunkhannock Township lobbied passionately for the approval of an independent air study prior to its imminent construction. At least 50 people packed the board room, sitting on the floor or standing in the doorway to the outer office when there were no more chairs. Many were curious first-timers attracted by months of reported public discourse. They, and a number of students in attendance, got a crash course instead on how an orderly meeting can descend into chaos. What appeared at first to be a disagreement between the commissioners and citizens who back the hiring of Dr. Timothy McAuley, an air quality expert from Queensbury, NY, devolved into an emotionally-charged fray and personal confrontation between Commissioner and Chairman Tom Henry and several of his detractors. He did not immediately voice opposition to engaging McAuley and Consulting for Health, Air, Nature, and Greener Environment, LLC (CHANGE) in a study but suggested that, if every municipality in the county suddenly wants a study as well, the cost would literally bankrupt the county. “If the county is going to spend a half million dollars, I think they should have a vote on it,” he suggested. Henry said that he has grown tired of personal attacks against the commissioners to the press and on social media sites like Facebook and cautioned against used of divisive language before calling on the first speakers. He acknowledged the passion of those who opposed the sand plant and agreed that he too would prefer that the transfer facility not be built so close to town. But he also indicated that harsh rhetoric and questionable scientific information was making it difficult for him to decide what was best for most of the citizens of the county. The latter was an unveiled reference to Audrey Gozdiskowski, who has shared her opinions about the silica station and possible health issues in the wake of its first 10 years of operation at both commissioners’ and county planning meetings. Gozdiskowski exhibited a montage of photos taken of readings on a hand-held air monitor that she asserts indicates dangerous levels of toxic emissions related to sand and water tankers on local roads. Henry also challenged Gozdiskowski’s claim that she was participating in an official study being conducted by King’s College of London, UK. “I’m tired of listening to stuff that has no backing,” he stated. A newspaper reporter from Susquehanna County told Henry that she has interviewed researchers from the London-based college in Montrose and assured him that there is such a study underway. Eileen Barziloski, a Tunkhannock resident and small business owner who has also been very expressive in her disapproval of the handling of D&I Silica by county officials, struck a more conciliatory tone, offering the pro bono services of a neurosurgeon who would work with county planners to help mitigate some of the potential health risks that advocates insist are inherent with sand transfer facilities. Barziloski asked fellow advocate Anne White to read a letter written to the commissioners by former Wyoming County resident and now professor of atmospheric sciences Dr. Sarah Brooks that strongly advises that proposed air quality studies by Pennsylvania’s Department of Environmental Protection (DEP) and the federal Environmental Protection Agency (EPA) do not go far enough and will not produce sufficient evidence to serve as a baseline for future emissions testing. Henry allowed anybody who wanted to speak to have their say but, when the banter in the crowded board room reached a level of cacophony, he tried to bring the discussion to an end. Citizen participants and Commissioner Ron Williams, who felt that they were being ignored and belittled, fought back. Williams interrupted the shouting match with a motion to bring the matter to an immediate vote. “We have to start somewhere,” he insisted. Henry balked, contending that the initial $150,000 investment in the proposed independent air quality study would likely lead to additional requests for testing that the county cannot afford. Municipal leaders in Factoryville and Mehoopany had already made inquiries, he related. One man questioned how it had been decided that the proposed study would be brought to a vote with no mention of it on the agenda, and Williams assured him that any item need not be on the agenda to be brought to a vote. Another round of accusations and insults ensued. Several of the independent plan supporters asserted that the “obvious” will of the people, based on the opinions of those in attendance, dictated that the commissioners approve their plan. A former Nicholson resident who has just moved back to the county rejected that notion, even though she was deeply concerned about the subject matter that had been presented. The results of an independent study would have little bearing on the situation, she insisted, if DEP and the state have not yet set standards. “You need standards and policies, and they are going to have to come from DEP,” said Mead, suggesting that the EPA will help them, borrowing on models used in other states. Henry and Mead looked to each other and shared a quick and inaudible exchange as the audience waited for someone to second the motion. “The motion has been denied,” Henry stated, bringing a split second of silence to the room followed by murmurs of discontent. “Are you dis-approving it?” someone asked. “We need to work with DEP and EPA,” Mead added. Williams maintained after the remainder of the meeting was conducted and adjourned that Commissioners Mead and Henry were wrong to have tabled the measure and should have voted to allow CHANGE to conduct a first round of air quality tests. “It is the right thing to do for health, safety, and the welfare of every citizen of Wyoming County,” he stated. The next meeting of the Wyoming County Commissioners is set for Tuesday, January 13. With the intense meeting you mistakenly claimed that I insisted the high readings were from sand and water trucks on local roads. I have no idea why the readings were high and the video that was taken shows that I did not claim the cause. All I do is plug in the monitor, monitor and download the info. I wonder how often high readings occur and without constant air monitoring in Mehoopany and other areas of concern who knows? The responsible party did not call to report an incident-scarey to think how often this can occur when no one is monitoring. Whatever industry that caused it should have reported it or perhaps they did and we just aren’t hearing about, much like the Regency Compressor Station explosion, fire. Residents were not even contacted. Wonder if the readings were from the pollution traveling from that which happened the day before. With the intense meeting you mistakenly claimed that I insisted the high readings were from sand and water trucks on local roads. I have no idea why the readings were high and the video that was taken shows that I did not claim the source. All I do is plug in the monitor, monitor and download the info. I wonder how often high readings occur and without constant air monitoring in Mehoopany and other areas of concern who knows?